I’d come to Washington expecting to see some antennas-after all, I was attending a Satellite TV Technology conference (STT, Box G, Arcadia, Okla. 73007). But the antenna farm showed me how fast the field has grown since Popular Science first reported on backyard satellite-TV receivers [PS, March ‘801. Once a toy of the super-rich—or the electronically gifted—satellite-TV terminals are becoming a middle-class luxury. “No fewer than 1,500 terminals are installed each month,” STT’s Bob Cooper told me at the conference. Cooper started it all by installing—and publicizing—one of the first private satellite-TV receivers back in 1978. What does this growth mean? Today nine domestic-communications satellites hover 22,300 miles over the equator, within “sight” of the U.S. Some have 24-channel capacity. And the FCC recently approved applications for 20 more satellites. 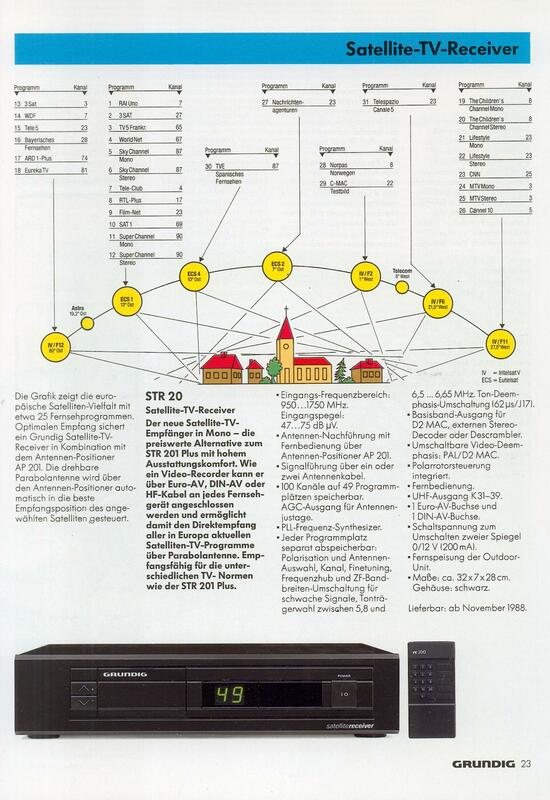 By 1984, predicts Cooper, there will be about 500 channels available. What’s on the satellites? Cable channels like the all-sports ESPN and Spanish-language (SIN) networks; super-stations like New York’s Channel 9; religious networks; and, of course, the paid-subscription, all-movie channels. High-powered transmitters on Earth beam this cornucopia of programs to the satellites, which re-transmit them to cable stations across the country. But anyone can pick up the broadcasts, as long as nothing blocks the view and there’s no ground-based microwave interference. What do you need? First, an antenna—10 or 15 feet in diameter—to gather and concentrate the microwave signals. Weakened by their long journey, the signals must be amplified, then converted from the very high frequencies the satellites use down to standard UHF frequencies. This job is done by electronic equipment—a low-noise amplifier and what the industry calls a down converter. Coaxial cable carries the signals inside to a receiver. It has no screen or speaker, but it may have a demodulator to convert the signals to frequencies your TV set can pick up. The cost of all this has come down drastically. 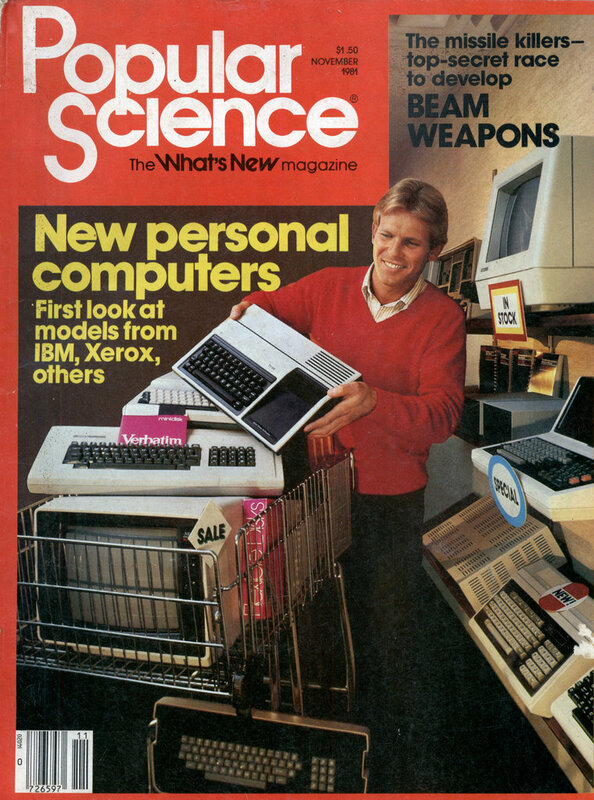 Commercial versions once cost hundreds of thousands of dollars. Two years ago you’d pay at least $10,000 for a “turnkey” system, installed by the dealer, to pick up just one channel on one satellite. More versatile systems cost up to $36,000. At the STT show, I saw good basic systems that cost about $5,000, installed. High-end systems with superior reception and convenience features go to $16,000. There’s an even cheaper route. You can assemble your own antenna from a kit, pour the concrete footing, raise the antenna, and cable the electronics together. Many companies, such as Downlink (Putnam, Conn. 06260) and Global TV (Box 219, Maitland, Fla. 32751), sell all the components. Downlink charges $2,650 for a kit that includes the manual. With a preassembled 12-ft. antenna the price goes to $3,595. Global offers a complete system for $2,700. For $6,995, you can buy a bolt-together antenna and a semi-assembled receiver from the Heath Company. This kit rivals the $16,000 systems in sophistication. Two years ago you couldn’t buy such systems. If you scrambled around, you could buy the components from several different manufacturers: Price? About $7,000. “Today a smart shopper can do it for $2,500,” Cooper said. Best of all, even the least expensive components have features you couldn’t buy two years ago. You once had to tune in different channels with a screwdriver. Now you just flip a dial. To switch between satellites you had to go out and shove the antenna around to a new position. Now you sit inside and punch a few buttons. You have to pay the piper But is it legal to watch satellite TV at all? It’s definitely legal to own a dish—the FCC lifted all licensing requirements back in 1979. But as the Heath Company notes, it’s up to the customer to comply with all laws and pay fees if programmers charge them. Some do. The all-sports ESPN network charges a $100 lifetime fee. Some don’t. Religious-program networks are delighted to have more viewers; they ask only a letter requesting permission. And some won’t. HBO, Showtime, and some other all-movie channels won’t even consider individual applications, citing copyright laws. The satellite-TV industry is working, through an industry organization, to come to some agreement with the major program suppliers. Meanwhile, most satellite-TV viewers figure that they have a right to pull in signals raining down on their roofs. Soon a different type of signal will be raining down on our roofs. RCA, CBS, Comsat, Western Union, and nine other firms recently applied to the FCC for permission to launch high-frequency direct-broadcast satellites. These will be more powerful than current satellites, so a smaller antenna could pick up their signals. Comsat, the first to apply, says its two-foot-diameter antenna will cost about $100. The company plans to rent the electronics—including a descrambler—for about $25 a month. For that fee the viewer will get three channels of entertainment. Will today’s backyard antennas be able to receive direct-broadcast programs? Bob Cooper says no. “It’s a totally different frequency band. All this equipment is frequency-conscious, except the antenna. If the surface is accurate enough it might be able to focus this higher frequency effectively,” Cooper said. “Maybe two antennas in that parking lot can do it,” he added. The good ole days when dishes were the size of a shed and signals were not scrambled. @ Mike – Yea, it looks like he could get HBO Mars with that thing! Those were the days – 57 channels and nothing on! Interestingly the modern satellite dish is about the size of that TV, and modern TVs are approaching the size of that dish. And now days people hijack old military military communication satellites to rebroadcast soccer games. You could just about hold a soccer game in that dish. You can actually see where it went wrong. 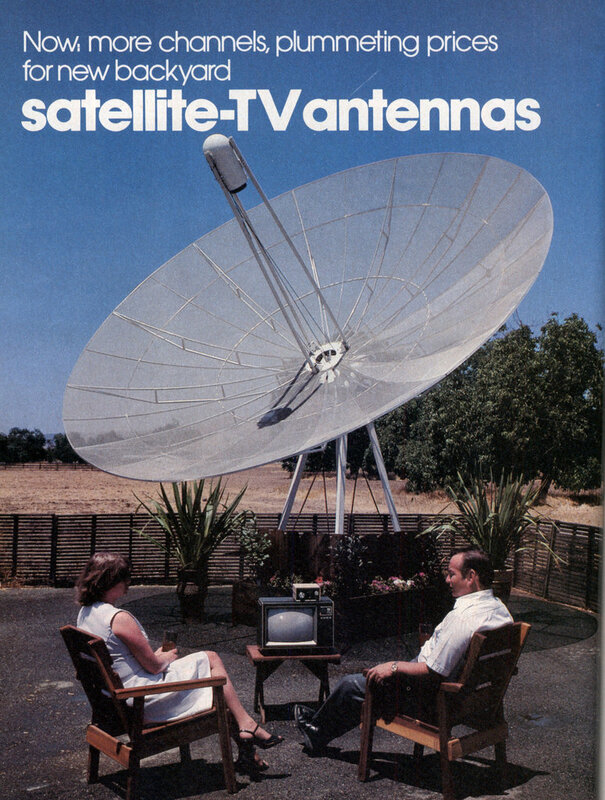 In the US satellite reception was always seen as a “business model”. In Europe it simply was another way of getting your signal out. So stations rented transponders and people just put up dishes just like they would with terrestrial antennas. Casandro, I don’t think the paid movie channels played commercials, so their business model was paying for programing. Getting the signal out is fine if you have a way to pay for getting that signal out. @Mike: Well in Germany there never was much Pay-TV. Currently there is, but they have commercials. BTW commercials in Germany are more tightly regulated than in the US. So on average your 30 minute show will be interrupted only once. Public television channels have next to no commercial breaks. (perhaps a hand full a day) So “no commercials” is not an issue. There’s currently a new business model going on called “HD+” where you pay for HD versions of Free to Air channels in order to finance the conditional access system the stations put in place…. That doesn’t sound like a very attractive business model. Most channels they advertised where foreign. I prefer the Ritter/Dawber “Stay Tuned”. YouTube has the entire movie. Part 3 has the evil dish and the animated sequence. The last part should have the 4th wall breaking gag.